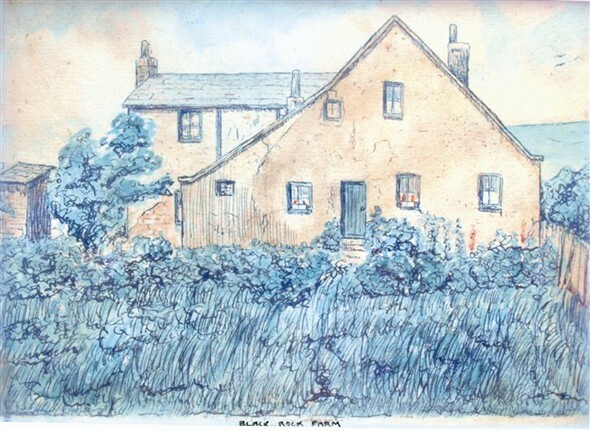 My father, Frederick Holford, was born at Black Rock Farm in 1906. His father, Lawrence Holford, had carted building materials for the construction of Roedean School and had then started farming at Black Rock. He was a 'greenmeat' supplier and sold fresh grass and clover etc, to the brewery stables in Brighton. He had two horses, 'Captain' and 'Lion'. My father had one elder brother, Lawrence, who was killed by falling aircraft debris while on duty as a special constable in Brighton in 1941. Frederick had two elder sisters, Olive and Ivy. Ivy travelled round the world and ended up living in Canada. My favourite aunt, Olive, stayed in England and was working as a housekeeper in Henfield when I remember her. I don't know the date of the painting. The story is that an artist was on a walking tour and asked to sleep in the barn. Instead of paying for accommodation he painted the picture. My father also told of a man with a dancing bear who would stay in the barn when visiting Brighton. (It must have been a comfortable barn, as the 1901 census has two people living in it!) As a boy/young man my father was interested in 'wireless' and had an enormous length of wire strung along the cliff top with which he was able to pick up signals from the Eiffel Tower. My grandmother planted a tamarisk hedge round the garden. When I visited Brighton in the early 60s I noticed a tamarisk hedge on the golf course and wondered if it could be the same one.